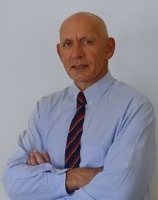 Bollinger Band Width is described by John Bollinger on his website. It reflects the width of Bollinger Bands on the price chart. Bollinger's Bandwith Indicator is used to warn of changes in volatility. As we know from using Bollinger Bands, a squeeze where the bands converge into a narrow neck often precedes a rapid rise in volatility. A Bollinger Band squeeze is highlighted by a fall in the Band Width indicator to below 2.0%. Bollinger claims that a drop below 2% on the S&P 500 has led to many spectacular moves, but warns that the market often starts with a fake move, in the wrong direction, before the real move commences. 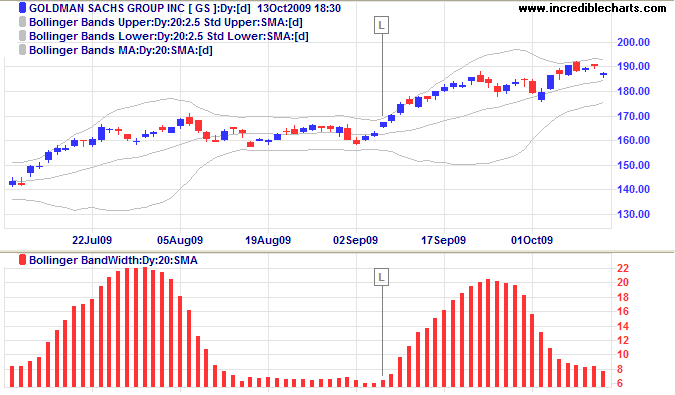 Goldman Sachs is displayed with 20-day Bollinger Band Width. Go long [L] when Bollinger Band Width starts to rise after contracting to a historic low. Bollinger requires contractions below 2.0%, but wider contractions provide perfectly adequate signals. The default setting for Band Width is a 20-Day simple moving average with bands drawn at 2 standard deviations.